With 84,254 charges of discrimination filed with the EEOC in 2017 (each with the potential to cost companies thousands of dollars), organizations have considerable motivation to limit their exposure to such claims. This whitepaper explains why preventing discrimination isn't always a simple task and provides employers five specific strategies to help them limit the risk of a claim. 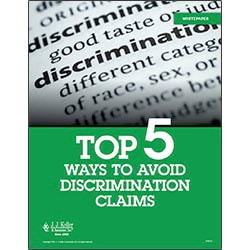 Fill out the form to download your free Top 5 Ways to Avoid Discrimination Claims whitepaper.